Conventional Raman spectroscopy often has difficulties with background interferences and the measurements setups are usually sealed even from low intensity ambient light. Time-resolved Raman is more suitable for studying high temperature samples and their polymorphic and phase transitions as the measurement principle is significantly less sensitive to ambient light and thermal emission. 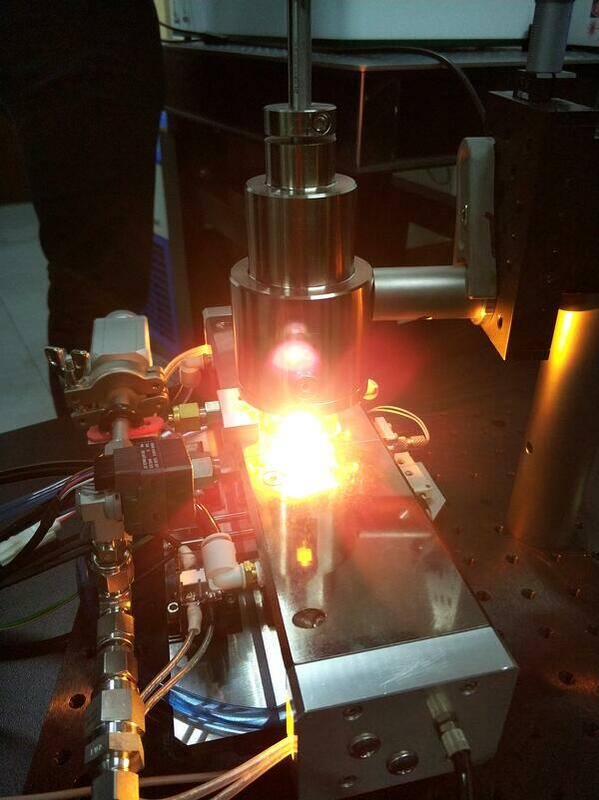 Timegate Instruments’ demonstrations at the Shanghai University SKLASS laboratory included CaSiO3 glass measurements in varying temperatures up to 1600°C. The temperature dependent changes in the sample material are clearly observable from the measured spectra (spectra presented below). Figure 1. CaSiO3 glass spectra measured in varying temperatures with the Timegated measurement principle. Figure 2. Timegating minimizes thermal and ambient light interference. The sample was continuously measured in a heating cell through a transparent window while the temperature was adjusted to desired levels. During time-resolved measurements the detector is only active for extremely short repeated periods of time. 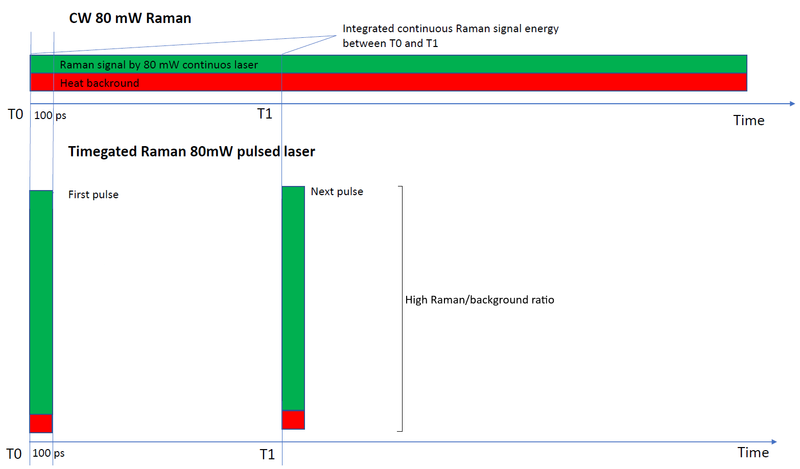 A pulsed laser which is used in time-resolved Raman has a very high instantaneous pulse energy and the instantaneous Raman scattering “burst” intensities are high compared with conventional continuous wave Raman scattering. These features lead to collection of high intensity Raman scattering in very short repeated time periods i.e. the collected Raman scattering to background emission ratio is high. Because of this, time-resolved Raman is significantly less sensitive to continuous background interference like ambient light or thermal emission. This principle is depicted in the figure below. Figure 3. Background interference suppression of a time-resolved measurement is based on collecting high intensity Raman scattering bursts/pulses only during very short time periods. 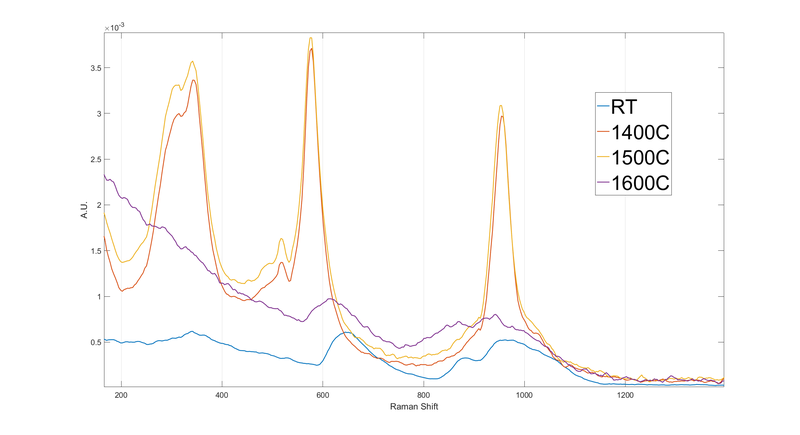 No spectral information is collected between these high intensity Raman pulses. Beijing Full-Band Science & Technology Development Co Ltd., Timegates´ retailer in China, established a Timegate Picoraman laboratory at Shanghai University together with State Key Laboratory of Advanced Special Steel (SKLASS). The laboratory is the first one in China to have a PicoRaman spectrometer and thus enabling pioneering research with Timegated® Raman spectroscopy. Timegate Instruments visited Shanghai University and the SKLASS laboratory this January for instrument installation while also participating in a high temperature measurement workshop, where we gave technology demonstrations. The workshop attracted many participants including Beijing University staff and students, partners and potential customers and we were honoured to give a lecture about our technology and its applications. Many thanks to Beijing Full-Band Science & Technology Development Co for arranging and hosting the visit and thanks to all workshop participants. Figure 5. Attendees of the high temperature measurement and time-resolved Raman workshop. 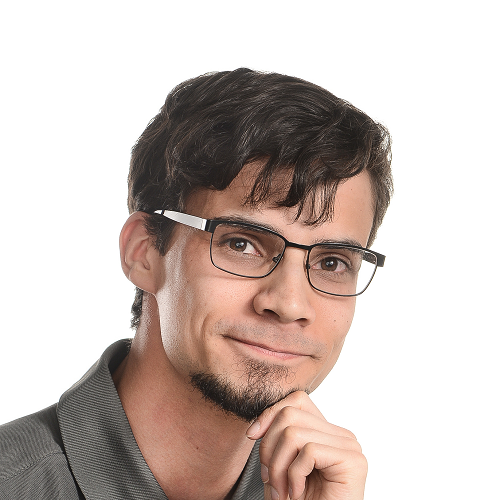 Application Specialist Bryan is a young and energetic chemist with a degree in M.Sc. (chemistry) and experience and background in analytical chemistry. He has work experience in fields of pharmaceuticals, mining industries and R&D projects. Bryan is focused on studying Timegated Raman spectroscopy applications and development of data processing algorithms and routines.